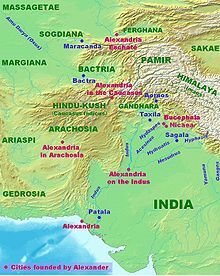 Alexandria in Arachosia (Greek: Αλεξάνδρεια Αραχωσίας) was a city in ancient times that is now called Kandahar in Afghanistan. It was one of more than seventy cities founded or renamed by Alexander the Great. Arachosia is the Greek name of an ancient province of the Achaemenid, Seleucid and Parthian empires. The province of Arachosia was centred around the Argandab valley in Kandahar, Afghanistan. It did not reach the Hindu Kush, but it apparently extended east as far as the Indus river, although its exact extents are not yet clear. The remains of Alexandria in Arachosia are today found in the tell of Old Kandahar citadel in the western portion of the modern city. The citadel tell was excavated by the British Society for South Asian Studies through the 1970s and with the relative improvement in security from 2008–2009. These excavations indicate that the Islamic walls were based on those from classical times indicating what might be a square (tetragonis) shaped town, but one highly modified by the unusual topography. A triangular shaped portion of the tell adjoining the Greek town is from the Buddhist era. Alexander appears to have founded his town on the site of 6th century BC Persian garrison point. The pass, river and junction of three long distance trade routes made the location of strategic importance. To date, no Greek buildings have been found, but numerous coins, inscriptions and graves have been. Further discoveries are anticipated as excavation reaches deeper strata of the tell. The citadel walls have been shown to have contained circular towers similar to those at Farah, Balkh and Nadi Ali Sorkh Gdagh, although these could be Islamic in age. ^ Schmitt, R. "Arachosia". Encyclopaedia Iranica. ^ Arrian. "Book 5". Anabasis. Wikimedia Commons has media related to Old Kandahar. Lendering, Jona (2018). "Alexander's City Foundations". Livius.org. "KANDAHAR ii. Pre-Islamic Monuments and Remains". Encyclopædia Iranica. 2010. Retrieved 26 October 2018.